The cost for the road test service will be $40.00, payable the date the road test is administered. It is not required for students to complete the road test through our school, as the SC DMV will still be administering the road test daily during the week. For students who have difficulty getting to the DMV during normal business hours, we offer test administration on weekends. All tests administered through our school are done in our vehicles, with our instructors. If you want to take the road test through our school and use our vehicle (the UNFAIR ADVANTAGE), email us using the form on the Contact page, and specify the “Road Test” in the message section of the form, include your full name as printed on the permit, your permit number, contact phone number and the city you wish to test in. Once we have this information we will notify the SCDMV at least 48hrs before testing. 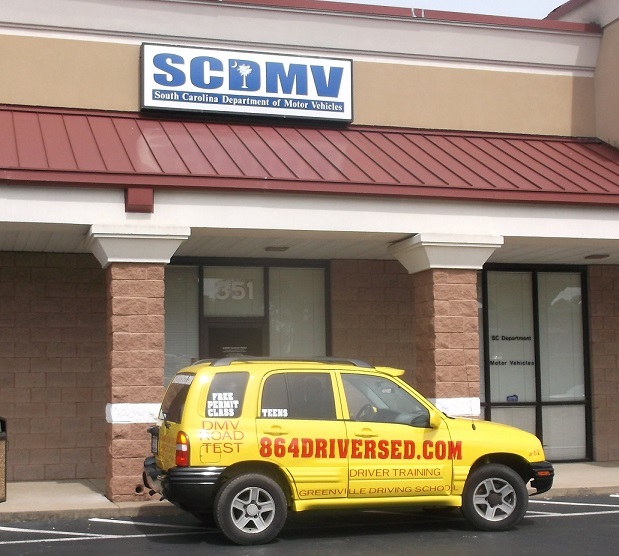 On receipt of confirmation we will call you and confirm SCDMV approval and the time we will be able to test you. It is best to get these emails to us by wednesday if you are going to test with us on sunday. The Unfair Advantage is just what it says. The vehicles that we use for training and testing have been selected on purpose to give the student the easiest way to maneuver a test car into and out of the parallel parking spot. The high position of the driver, large rear window, no rear trunk and very short wheelbase make our vehicles the easiest to take the road test in, the easiest way to pass your road test. No other driving school has a vehicle that performs better on the road test. We know, we have tried them all. Just take a look at these pictures of our testing and training vehicle in the SC DMV’s parallel park and you will see why this is the best choice when it comes to taking your test. Here we are at the SC DMV’s office, ready to take the road test. Here we are in the middle of the SC DMV’s parallel park – just look at how much space there is in front of and behind our training and testing vehicle. We can move all the way up to the back barricade of the parking area, leaving plenty of space in front of us to pull forward to the middle without receiving any penalties during the test. South Carolina Driving School, no other driving school makes it easier for you to pass the test. Just look at all that space – this is the easiest way to pass your test. Setting up a road test. If you are a student of our driving school, you will setup your road test with your instructor that teaches you the driving portion of your course. If you have not driven with one of our instructors you can still test with us. You can also come to our Lyman / Duncan / Greer main office, 7 days / week and take the test with our examiner, using our car.